I have just released my How To Make Whole Wheat Pizza Dough video (above), showing step by step, how to make an all natural pizza dough utilizing whole wheat flour. My recipe uses a sponge method to enable the whole wheat flour to absorb liquid, develop gluten, and establish a vibrant yeast growth before finishing the dough. I use a 50:50 mix of whole wheat flour and bread flour to obtain a balance between the desire for whole grains and a light airy pizza dough. 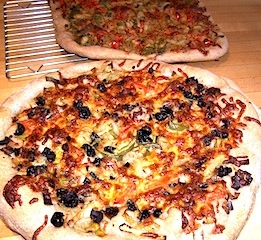 I have also included on my website, a recipe for Roasted Veggie Pizza (above, left), using my Whole Wheat Pizza dough, however you could of course use the topping on my regular pizza dough. Good night dear lady. I tried to make the pizza dough following your youtube video called "How to Make Pizza Dough" but the dough was very sticky and not flexible, what did I do wrong? can you please help me. You are a wonderful cooker, all your recipes are excellent! Arturo - Did you use bread flour? The quality and strength of the flour is important. High gluten content is necessary to develop elasticity. Try again with a good bread flour and if it feels too sticky, knead in a little extra flour at a time until the dough is manageable. Also, make sure that you knead it long enough (5-8 minutes). By the way, King Arthur bread flour is the brand I usually use. Good luck to you! Good evening. In your "Susan's Pizza Dough recipe" you say that let the dough rest until risen 1 1⁄2 times in size and after that the Pizza Dough is ready to use. I followed your recipe but I left the dough rest all night and in the morning I put it in the fridge and I use it (baked it) in about at 6:00 pm, was It wrong? If I want to make the dough but bake the pizza the next day or after, what can I do? Un saluto from Italy and many thanks for the pizza dough recipe.After several tries,I finally did better thanks to your method Mrs Sady. Thanks a lot...I followed your recipe for the whole wheat pizza base from youtube, it came out amazing!!!! I let the dough rest and rise 3 times and kept adding flour until it stopped becoming sticky. it spreads outs without tearing. Thanks again!